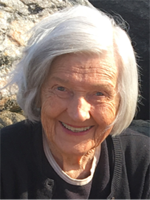 After a long and fulfilling life, Norma Jean Alyea Van Veld died peacefully in her sleep on Saturday, April 13, 2019. Since the death of her husband in 2016, she had resided at The Hidenwood Retirement Community in Newport News, Virginia to be near her son, Peter and his wife, Jan.
Norma was born on July 2, 1924 in Hebron, Indiana to Alice Osby and Louis Alyea. After the death of her mother at a young age, her father married Irma Walton, who was a loving mother to Norma. Norma graduated from Hebron High School and Indiana University. After graduation, she proudly served as a stewardess for American Airlines. Norma married Robert Dale Van Veld in Hebron on May 5, 1946. Bob and Norma had three children: Robert Dale, Jr., Nancy Jane, and Peter Alyea. The family moved to Wilmington, DE in 1956. In 1961, they moved to Greenville, NC where Norma became an active member of the community. She enjoyed her involvement with the Greenville Service League, the Greenville Museum of Art, and Timothy’s Episcopal Church. Gardening and cooking were Norma’s passions. She spent many happy times at Emerald Isle crabbing, clamming, fishing, and entertaining. These good times at “Mummichog” were shared with family and friends. Norma was preceded in death by her husband, Bob and her brother, Don. She is survived by a brother, Tom of Hebron and a sister, Connie of Indianapolis. Also surviving are her children: Rob Van Veld and wife, Tracy, Nancy Williams and husband, Malcolm, and Peter Van Veld and wife, Jan McDowell; and her grandchildren in whom she took such delight: Roy Van Veld and wife, Lauren Saks, Amy Williams and fiancé, Bennett Miller, Davis Williams and wife, Jenn, Rachel Smith and husband, Jeff, and John Hansen. Her beloved great grandchildren are Simon and Laine Van Veld, Bobby and Annabelle Bulman, and Curren and Reeves Williams and Gavin, Huxton and Gabriel Smith. Numerous adoring nieces and nephews also cherish many memories of “Gaggy”. At a later date and in accordance with her wishes, The Committal of Ashes will be held in the Memorial Garden at St Timothy’s Episcopal Church. In lieu of flowers, Memorial Contributions can be made to St Timothy’s Episcopal Church, 107 Louis St. Greenville, NC 27858.